NMC Sexual Assault Awareness Week 2018 will take place the week of April 9-13, 2018. 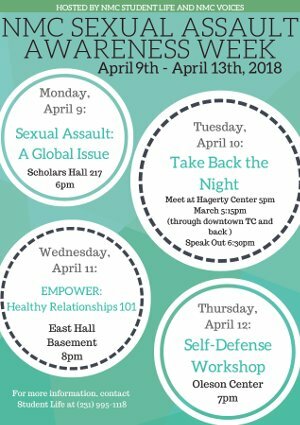 The week of events is hosted by NMC Student Life and NMC Voices, and includes a showing of a mini-documentary on sexual assault as a global issue, Take Back the Night on Tuesday, a Healthy Relationships workshop on Wednesday and a Self-Defense workshop on Thursday. For more information please contact Student Life at (231) 995-1118.